#RIP – Warm tributes have been paid to Cork Yacht Broker Paul Kingston (53), formerly of Kilmacsimon boatyard, who died unexpectedly at the weekend. A one time Irish Marine Federation (IMF) board member the news of his death has shocked both the local Cork boating community and his boating friends round the coast of Ireland. Paul ran a long established boat yard and brokerage business in the area first set-up in the 1970s by his father George. A member of Kinsale Yacht Club, Paul was a keen Dragon keelboat sailor and a motorcycle enthusiast. He was a big supporter of the Irish Boat Shows and a popular marine industry figure along the south coast. Lying in repose at the Temple Hill Funeral Home, Boreenmanna Road of Jerh O'Connor Ltd from tomorrow, Thursday. Removal at 7pm (same evening) to the Church of Christ the King, Turners Cross, Cork. Requiem Mass on Friday at 11am. Funeral afterwards to St Catherine's Cemetery, Kilcully. The Irish Marine Federation marked the retirement of Mr. Wally Morrissey of Crosshaven Boatyard from its board after a 30 year involvement with the industry body. The presentation was made at an IMF meeting in the Port of Cork offices today. Photo: IMF board members (seated) from left are David O'Brien (chairman), Wally Morrissey, Bernard Gallagher and Hal Bleakley. Standing: Steve Conlon, Mark McAuley, Hugh Mockler, Wietse Buwalda, Derek Reamsbottom, Ian O'Meara, Angus Levie. Photo: Bob Bateman. The Irish Marina Operators Association was founded in May 2003 and represents 23 of the coastal marinas around our shores. The IMOA is a self managing special interest group within the Irish Marine Federation, the trade association affiliated to IBEC representing the marine industry in Ireland. The IMOA elects its own representative board of directors, the chairman automatically having a seat on the main IMF board. The objectives of the IMOA are to provide a forum for discussion within the marina industry in Ireland and to represent the views of the marina operators to government in regard to legislation, regulation, training, insurance and health and safety issues. The IMOA is an effective lobbying body and has achieved some success in relation to approved waste management plans for marinas and also with the new Development and Foreshore Act. 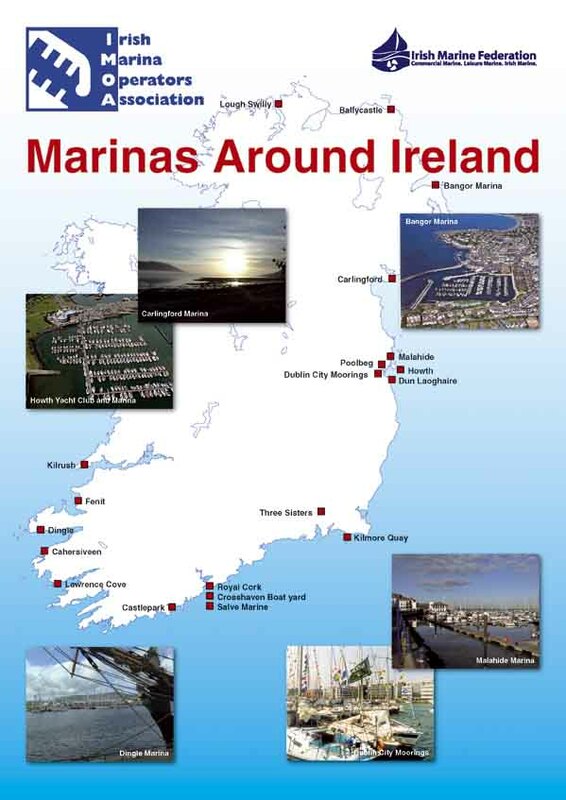 The objectives of the IMOA are to ensure that Ireland’s marina industry develops in a sustainable way and will eventually provide for a necklace of marinas around our coastline. In the future the IMOA will seek to have our marina infrastructure effectively marketed overseas as part of an integrated marine leisure tourism campaign.